I like saving money. More than that, I like earning money. Perhaps you do too. If you’re here, you probably searched “ING Direct Canada Orange Key”, so you know the drill. If not, I’ll explain: If you open an account with ING Direct citing someone’s Orange Key on ING, you earn an extra $25 (after you deposit $100). It’s a great bank. There are no chequing fees (and no other fees I’ve ever noticed) and you earn interest on any balance you carry. If you don’t find yourself needing teller services and you do most of your banking/bill-paying online, I would strongly recommend them. So if you feel like using my Orange Key below, go right ahead. Nothing bad will happen, and you can buy that new shirt and tie you wanted from Big V. I won’t lie, it gets me $25 too, which is why I’m sharing this, but you can shop out your Orange Key the same way once you sign up. And if you do use my Key, thank you! I really appreciate it, and I hope you enjoy your new money and savings. 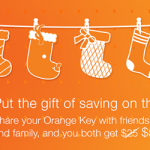 Share the post "ING Direct Canada Orange Key Gets You $25"
ING Direct Canada is giving you $50 to sign up with an Orange Key! Time to do it! Tangerine Holiday Double Bonus is Back! If you haven’t seen… new promo announced, valid for the rest of 2013! Get $50! Nikki Comma recently posted…ING Direct Canada is giving you $50 to sign up with an Orange Key! Time to do it!